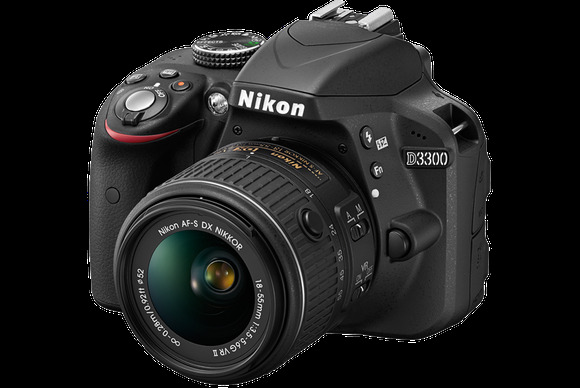 The Nikon D3300 offers a pleasing set of features for newbies as well as power users, especially given its relatively low price and compact size. At just $650 (including 18-55mm VR II lens), the D3300 is a strong choice for those looking to graduate into the realm of digital SLRs without breaking their wallets, yet it comes with enough advanced features to keep budding enthusiasts engaged. Note that the D3300 is a newer version of the D3200, which is still available. The D3200 may cost less, but it’s also a little larger than the D3300, and it lacks some of the D3300’s interface enhancements and speed—just 4 frames per second to the D3300’s 5 frames per second. If you already owned a D3200, you wouldn’t step up to the D3300. But if you’re buying new, I suggest going straight to the D3300 for a small premium. The D3300 has a 24.2-megapixel sensor. Nikon says its Xpeed image processing is optimized for the sensor, but doesn’t mention what generation of Xpeed is inside the camera. Physically, the camera is noticeably smaller and lighter than the 3200, and this is part of its appeal. The D3300 is not as small as the typical mirrorless interchangeable lens camera (ILC), but it won’t be as cumbersome as around your neck as a typical DSLR, either. It measures a full 0.2 inch narrower in width than, say, either the Canon EOS Rebel T5 or T5i, and it weighs 410g, 25g less than the Canon T5. Right out of the box, the D3300 distinguishes itself by feeling like a premium product, despite its small size and low cost. This is especially evident in the D3300’s buttons, power switch, scroll wheel, and 360-degree dial: Everything moves smoothly, like butter. Even the shutter mechanism sounds comparatively quiet and smooth. The D3300’s design is easy to learn and pleasant to use. My fingers could easily, almost blindly, find their way around the camera, with a comfy spot for my thumb to rest at the upper-right corner. The grip is a bit more shallow than some, but the thumb rest mitigated that and I had no issues holding the camera. The shutter button sits atop the hand grip, with an easy-to-move switch for on-off around the shutter. In a semicircle before the shutter sits the video record button, an Info button for turning on the rear settings display, and an exposure compensation button used in conjunction with the rear horizontal scroll wheel. Also on top of the camera sits a 360-degree dial with the usual settings (program, shutter priority, aperture priority, auto, and manual modes) as well as presets for Auto (with and without flash), portrait, landscape, sports, child, sports, macro, and night portrait. Two other modes on this dial set the Nikon D3300 apart from the competition—in part because of Nikon’s use of natural language to describe these features. One, clearly labeled Effects, provides easy access to 13 in-camera special effects, including toy camera, miniaturization, super vivid, night vision, and color sketch. The other, Guide, puts you in Guide mode, which provides guided operation of the camera based on the task you’re trying to accomplish. Considering how unwilling many of us are to pick up a manual when in need, this is a convenient and useful feature for those who might still need some hand-holding. The D3300’s on-screen display is very visual, with a touch of old-school skeuomorphic graphics for depicting shutter speed, aperture, and ISO. The visuals don’t get in the way much, and they provide a clean at-a-glance organization to what could easily become a cluttered-looking display. I liked that visual display, but some of these options—along with more advanced choices—are built into tabbed shooting menu, too. The D3300 has 11-point auto-focus, which is decent but at times limited my options when composing shots; if you’ve ever tried more, this could seem more constraining than you’d expect. Once you enable the option in the camera’s menus, changing auto-focus points is simple and fast, thanks to the aforementioned rocker switch. Entering Live View mode for shooting is simple: Tap a dedicated button, just above the rocker and below the thumb rest. The rocker makes it reasonably fast and easy to adjust focus in Live View, since you can move the focus point on an angle, too. While we had a sense the focus locked in quickly, it was still sluggish enough that you might miss that celebratory reaction shot if you’re depending upon split-second focus speed. The D3300’s capture speed is five frames per second—competitive for this class of cameras and faster than the Canon T5. That’s enough for many fast-moving environments, such as sporting events. At ISO 200, the D3300’s images looked very good. In P mode, the camera tended to meter in a way that it captured slightly darker exposures than on some of its competitors. Nonetheless, images looked great, with pleasing and accurate colors and sharp detail when viewed at 100 percent. While Nikon is known for capturing images with minimal noise at high ISOs, beware just how far you’ll want to push this model. As with other cameras in this class, images looked good up to ISO 800. By ISO 1600 you’d start seeing visible noise, and ISO 3200 and beyond became soft and noisy. Nikon rates its battery for about 600 shots. The Nikon D3300 is a well-designed camera with a lot of hand-holding features that will appeal to enthusiasts and budding shooters alike.